How do I choose the best CoQ10 supplement? As shown in the Review of CoQ10 and Ubiquinol Supplements, we have found that most (but not all) CoQ10 products contain what they claim. However, it's important to note that some are formulated to enhance absorption, allowing you to take a smaller dose, e.g., half the dose (see the "Absorption, Formulation and Dose" section of the report). This should be considered when choosing a product, selecting an appropriate dose, and comparing prices. It is also important know how and when to take Co10 to maximize absorption and minimize side effects. To get the most from "CL Approved" CoQ10 and ubiquinol supplements, see the Review, and check out our Top Picks. The best C0Q10 product I have ever used is the Nutrilite brand. I cannot thank you enough for your service! I have been able to get off my PPI completely due to your in-depth review of the many probiotics to choose from. I also appreciate your coverage of all the other supplements. Please continue to test the anti inflammatory supplements. I have RA and my Rheumatologist just told me that Inflammation is the root of all sickness. We know this already from reading all the research and I am so grateful for your help in finding things to help us. Thank you for your kind words, Wesley! I should so like to get off my proton pump inhibitors for good. Do you know to what wesley8518 refers? Thank you. Hi, I have been taking a CoQ10 with PQQ. Does this combination really have any added benefits than just taking CoQ10? Hi Alice - One clinical study has found the combination of PQQ and CoQ10 more beneficial for memory than PQQ alone -- you can read more about this using the link below. What is PQQ? Does it help with aging and memory? Is it similar to CoQ10? I have been taking Doctor's Best Curcumin, based on your review. I have also been taking "Relentless Improvemen"' Curcumin (as 100% CurcuWIN). What's your opinion on this supplement, and can you include that in your review. Thanks!. 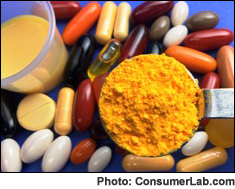 Hi Cam - CurcuWIN is discussed in the Turmeric and Curcumin Review here: https://www.consumerlab.com/reviews/ /turmeric/#bioavailability. Although none of the products in the current review contain this ingredient, we will keep your request in mind for future reviews. Hi great service you're providing! Would you test Rapunzel Cocoa Powder? Thanks Lamont! We just finished testing of cocoa powders, but we will keep this brand in mind for the future. When you next do a review of cocoa powder, can you indicate which products are highest and lowest in theophylline and theobromine? Is there a chance you could test more SHAKLEE products? Hi Darlene - Thank you for your suggestion - we will keep it in mind for upcoming reviews. You can find a list of Shaklee products we have tested here: https://www.consumerlab.com/Search/Shaklee-Review. Hi Paula - Yes, divided dosage is recommended when the total daily dose exceeds 100 mg. You can read more about this here: http://tiny.cc/5d4nlx. I have found that taking ubiquinol late in the day or at night disturbs my sleep. I now take one 100mg at breakfast and one at noon. Problem solved. You test Vitacost and Qunol CoQ10. Could you please test their Ubiquinol versions: Vitacost Ubiquinol CoQH 100 m and Qunol Mega CoQ10 Ubiquinol 100 mg? Thanks. Hi Paula - thank you for your suggestion. We will take this into consideration for our next review. Would you please consider including Pro Caps Labs (Andrew Lessman) products in your testing? Your website is such a valuable resource. Thank you for all you do to protect consumers. Thank you, Cathy. We have tested a number of Andrew Lessman products - you can find a list of them here: http://tiny.cc/1b6mlx. How does Q-Gel compare to ubiquinol in absorption potency? As discussed in the section on Absorption in the CoQ10 & Ubiquinol Review (http://tiny.cc/iw1nlx), Q-Gel (a formulation of CoQ10) is better absorbed than regular CoQ10, while ubiquinol is an active form of CoQ10 and may also be better absorbed than regular CoQ10. There are also special formulations of ubiquinol available, which may be better absorbed than regular ubiquinol. However, per your question, we are not aware of any direct comparisons between Q-Gel and ubiquinol. Do you have any data on Swansonvitamin.com products?, especially the coq 10 products, Ultra probiotics which contains 67 billion beneficial bacteria? We did not test Swanson CoQ10 in our most recent CoQ10 Review, but we did test Lee Swanson Genetic Designed Nutrition Ultimate Probiotic Formula in our latest Probiotics Review: https://www.consumerlab.com/reviews/Probiotic_Supplements_Lactobacillus_acidophilus_Bifidobacterium/probiotics/. You can find a complete list of Swanson products we have tested here: https://www.consumerlab.com/Search/Swanson-Review. Under the Product Tests tab, there is a link to choose reviews by brand. Second paragraph down. If you click on that, then sort under N, you'll find a list of all of the NOW products that have already been tested. There are several. I watch this list closely as I like NOW as a more affordable, yet still high quality, brand. Some good reviews in there. We have tested several Trader Joe's products - you can find the list here: http://tiny.cc/ianmlx. I find your site so valulable. Could you please consider reviewing Invite Health commpany products. They are expensive, but very well made, considering their quality, a value product. Yes, do NOW products, please. I really wish you would include NOW supplements in your review. Hi Jacqueline - We tested NOW Ubiquinol CoQH-CF in our latest CoQ10 Review (ubiquinol is the reduced form of CoQ10). We've also tested a number of other NOW supplements - you can find the list here: http://tiny.cc/2wdmlx. I use NOW supplements. They work great for me and are well priced. This CL Answer initially posted on 9/2/2014. Last updated 8/8/2017.